A Greek American is a citizen of the United States who has significant Greek heritage. Greek Americans have a heavy concentration in New York City (most notably in Astoria) and Chicago. Smaller communities exist in the greater Detroit, Cleveland, Boston and Baltimore areas. Tarpon Springs, Florida is also home to a large Greek-American community. According to the 2000 U.S. Census Report, there were 1,153,295 people of Greek heritage living in the United States that year. 365,435 Americans spoke Greek at home. The first Greek known to have arrived on U.S. soil was a man named Don Theodoro, who landed on Florida with the Narváez expedition in 1528. He died during the expedition, as did most of his companions. In 1768, about 500 Greeks from Smyrna, Crete and Mani settled in New Smyrna, Florida (near present-day New Smyrna Beach). The colony was unsuccessful, and the settlers moved to St. Augustine, Florida in 1776, where their traces were lost to history though every indication is that they were absorbed into the local Spanish population. The first significant Greek community to develop was in New Orleans during the 1850s. By 1866 the community was numerous and prosperous enough to have a Greek consulate and the first Greek Orthodox church in the United States. During that period, most Greek immigrants to the New World came from Asia Minor, and those Aegean islands still under Ottoman rule. 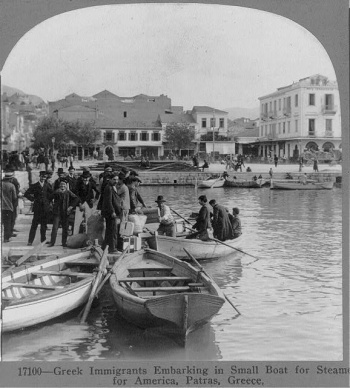 By 1890, there were almost 15,000 Greeks living in the U.S.
Immigration picked up in the 1890s, mostly because of the displacement caused by the hardships of Ottoman rule, the Balkan Wars and World War I. 450,000 Greeks arrived to the States between 1890 and 1917, many as hired labor for the railroads and mines of the American West; another 70,000 arrived between 1918 and 1924. Changes in immigration laws after 1924 significantly reduced the immigration rate; less than 30,000 arrived between 1925 and 1945, many of whom were "picture brides" for single Greek men. Greeks again began to arrive in large numbers after 1945, fleeing the economic devastation caused by World War II and the Greek Civil War. From 1946 until 1982, approximately 211,000 Greeks emigrated to the United States. After the 1981 admission of Greece to the European Union, numbers fell to an average of less than 2,000 annually. In recent years, Greek immigration to the United States has been minimal; in fact net migration has been towards Greece. Over 72,000 U.S. citizens currently live in Greece (1999); most of them are Greek Americans. Atlantis (now defunct) was the first newspaper published by the Greek American community. "The National Herald" was first published as a Venizelist alternative to "Atlantis". "Proini" provides a left-of-"The National Herald" viewpoint and more detail on news from Cyprus. This page was last edited on September 8, 2011, at 07:35.